The vast majority of trips covered on my blog are going to be Czech based but a combination of the Czech winter break and an ice hockey international break meant this weekend was perfect for a little overnight trip to Germany. Unfortunately I only planned it about a week in advance so the train prices were high and the available times were quite bad meaning I opted to do the 3 hour drive after finishing work on Friday afternoon and stay overnight. I booked a bed at 'Homeplanet Hostel' (€15 for a bed in a 4 bunk dorm room) which is situated in the heart of Connewtiz - quite a lively area in the south part of Leipzig. I was a frequent hostel user when travelling 15 years ago but I have to admit my hostel dorm room days are coming to an end. At the moment I can just about manage one night and as hotel prices in Germany tend to be quite high I wasn't too bothered about a few hours here. It's a cosy little hostel with nice staff and free coffee. If you're on a one night trip I recommend it although it's about 50 mins to the stadium by tram. I decided to have a walk around Connewitz, found a great little place for a kebab (Olive Tree) and then headed to an Irish pub (Killiwilly). I'm not usually one for visiting Irish pubs unless it's a last resort. I've been a little put off by the deserved bad reputation they get among locals in Prague but I'd heard some good things about this place so I popped in for a lovely pint of IPA and some Bundesliga 2 action on the big screen. The tram system in Leipzig is fairly simple (€1.80 single journey or €7.20 day ticket) and after dodging a few groups of drunk German students I hopped on and headed back towards the hostel to try the pub below it. It was quite lively inside but mainly groups of colleagues/friends/families which disappointed me a little as when doing these trips alone I enjoy discovering little bars and chatting to locals. I got the last table and ordered a pint of Ur-Krostitzer Pils. 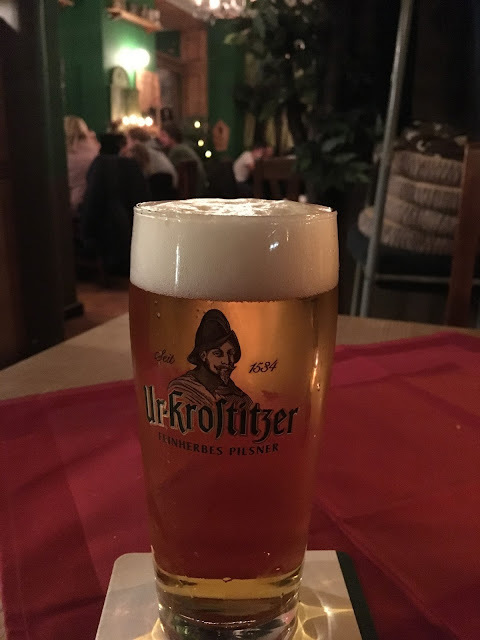 It's the local beer brewed 20km away in Krostitz. I wasn't overly impressed with it but it was drinkable and I had quite a few. German beers always taste too sweet and not bitter enough for me. I'm yet to find one that comes close to a Czech pilsner but I'm still hopeful! It's definitely an easy-going pilsner and would be refreshing on a summer groundhop. A group of people then came in and I gave up my table so they could eat (which earned me a free pint) and spent the rest of the evening sat at the bar chatting to the barman. I wanted to ask about the Red Bull situation and get a local's view on the whole saga. I know what the rest of Germany think about it but unfortunately he didn't really seem too interested in football and supported the Leipzig ice fighters ice hockey team. I explained how my original plan was to take in an ice fighters game that night until I found out it was an hours tram ride away from the hostel and didn't start until 8pm! Bad planning on my part. I woke up the next morning to heavy snow and decided I'd drive into the centre and park up so I would be able to set off home straight after the game rather than get a 50 min tram back to Connewitz. I went through my usual hostel routine of trying not to make a sound getting dressed and zipping my bags while my hungover dorm mates were sleeping. I'm not sure why I care as nobody else seems to but I think it's in the British DNA. I caught the centre of Leipzig on a good day. Well, it was crowded but there was a lovely atmosphere. 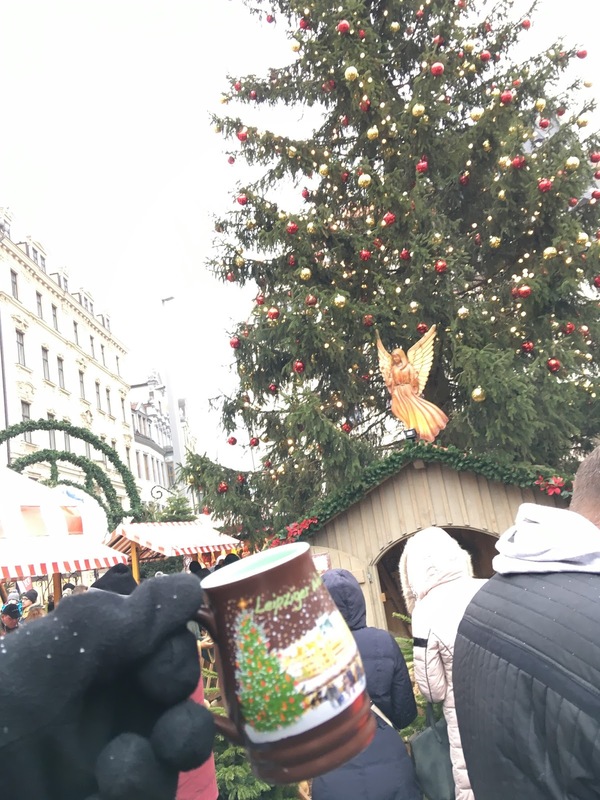 It was Christmas market season and the streets were packed with locals and tourists sipping their mulled wines. 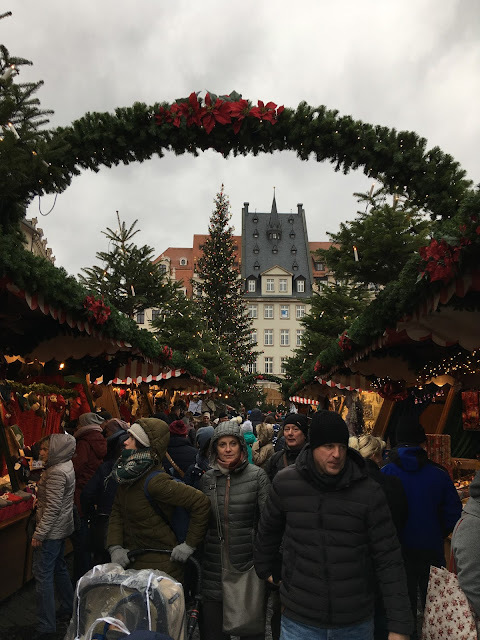 The Christmas markets in Leipzig were what you would expect although they were a lot less touristy than Prague which I did appreciate. I counted quite a few Mainz 05 fans enjoying the festivities too and everyone was in good spirits. The streets were all blocked by heavily armed police as is the norm these days in Germany but it didn't take too much away from the atmosphere. Leipzig Christmas market complete with a man who clearly wants to get his wife away from there as quickly as possible"
I limited myself to one mulled wine (for driving purposes and therefore sacrificing my pre-match pint) and headed off to see some sights. 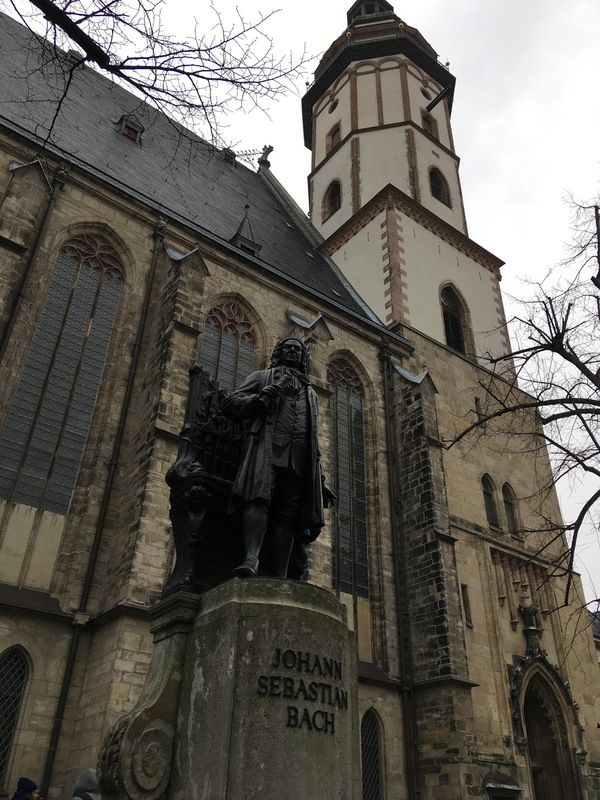 My first stop was St Thomas Church which is quite famously associated with Johann Sebastian Bach who worked there as a kapellmeister until his death in 1750. I always seem to feel the need to go inside a church when travelling around Germany and the Czech Republic. I'm not in any way religious they just seem so grand and breathtaking compared to the ones I remember when growing up in Blackpool. I then headed to the City-Hochhaus on the recommendation of the barman from the previous evening...a 36 storey skyscraper right in the centre of town. I can certainly recommend this as you get a great panorama of the city for a reasonable fee of 3 euros. Unfortunately I went up during a blizzard so I couldn't see anything and I was absolutely freezing. It must be nice on a good day! I had the obligatory bratwurst and decided to walk to the stadium (about 15-20 mins from the centre). I did notice a few bars on my way towards the red bull arena although none of them looked particularly enticing. As is common in Germany there were the usual beer stands and bottle collectors on the paths leading up to the ground. 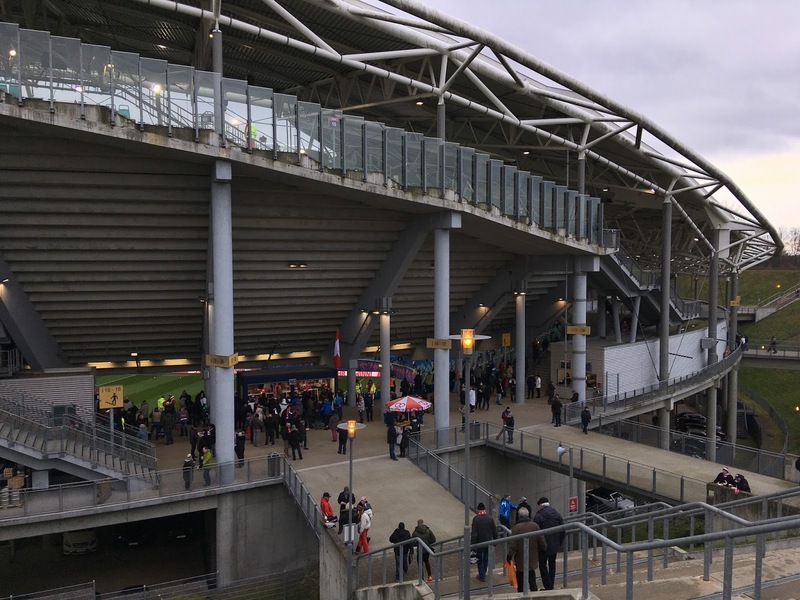 The first thought that struck me on approach to the stadium was that it reminded me a little of the Amex in England...built into the countryside. Walking into the ground you can see the excitement of the fans as they drink their mulled wine (it was a cold day) and take their places making sure not to miss the (excellent) club anthem. The situation surrounding RB Leipzig has been well documented but I don't really see why the fans should be victimised. It's not like they came in and destroyed a club like you are seeing all over England. They took over a 5th tier side and put a plan in place to take them to the Bundesliga within 8 years (which they did) and the way they did it ensured that the original club lived on...same name, same place. Dortmund fans still boycott the Red Bull Arena and I get that they don't want big companies in football but why blame the fans? There have been quite a few situations where fans and players of Red Bull have been abused and attacked. That's just pathetic. 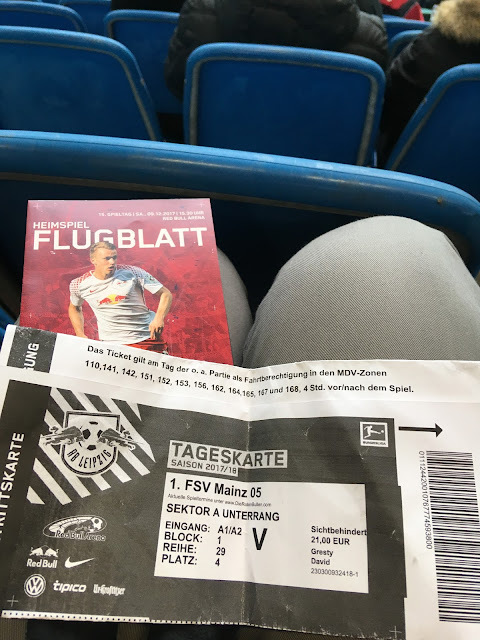 I had a flick through the programme and settled down for what was actually my first ever Bundesliga match. I'm sure I've seen German teams in friendlies and European competition but that's about it. It was also my first ever competitive match in Germany. The ticket for what were quite excellent seats in the corner was 21 euro (Category 3). Take note Premier League! The stadium was comfortable and the view would have been excellent from anywhere. The ultras are 'seated' in 'Sektor B' which is behind the goal opposite the away fans who are in the corner between sektor C and D. I wouldn't say the atmosphere they created was anything too special. I really enjoyed the club anthem and it looked and sounded great but the noise in general didn't have much of a wow factor. As you can see from the picture below Mainz 05 had quite a small following and there were plenty of seats available in the home sektor c. I bought online through the RB website which was a fairly easy process with a little help from google translate but buying on the day wouldn't have been an issue. The game itself was quite good as I witnessed RB drop points for the first time at home all season. Mainz 05 did deserve something from it as they were happy to play on the break and caused Leipzig plenty of problems. I was a little disappointed that Naby Keita was an unused substitute bus as he's joining Liverpool at the end of the season it's just going to be one of those seasons for him. All in all an enjoyable day out. Getting to and from the stadium was easy enough with the wide pavements and trams going in different directions. I walked about 15 minutes back to the main station where my car was parked. The only complaint I have is that I really should have stayed Saturday night instead of Friday and had a few beers around the ground/at the game. I planned to have a few at the ice hockey friday night but that didn't work out. Next time! I'll be back for sure to see Chemie Leipzig as soon as I can!